Mobile application to remotely manage your downloads on your SABnzbd+ from your phone ! Need help configuring SABMobile ? Click here ! 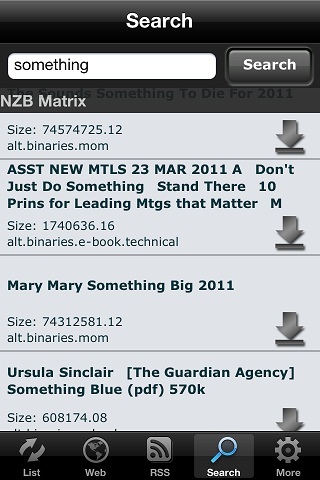 Ever wanted to download a file on your mobile device, but it was too big? Have SABnzbd+ installed at home? SABMobile is meant for you! SABMobile allows you to connect to your SABnzbd+ and manage your downloads. You will be able to add or remove files, but also check the speed or pause downloads. Have several SABnzbd+ servers? Often connect to it from home or work ? SABMobile handles connection to different SABnzbd+ and can manage different connection profiles ! The included web browser will help you choose the file you wish to download, and the smart search engine will allow you to look for files from anything. New smart search engines can be added dynamically, so you will never miss your good old finder. 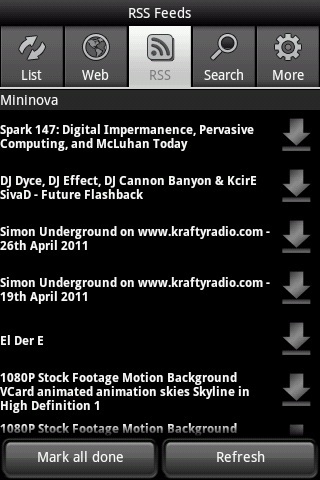 Morever, the built-in RSS reader helps you keep track of your software updates. You will be able to add new RSS feeds to SABMobile and be notified of new files to download. Afraid to open your SABnzbd+ access to the Internet? SABMobile handles both HTTP and HTTPS and is capable of connecting to it through a SSH Server, so it is completely secure! Of course, all of this is customizable, and the graphical interface has been polished for your greater pleasure. SABMobile is available in 10 languages: English, French, German, Italian, Danish, Norwegian, Swedish, Spanish, Finish and Dutch ! Remember that it is FORBIDDEN to download illegal stuff, and I can't be held responsible for what you download with my software! SABMobile is available on the Apple AppStore, on the Windows Phone MarketPlace, on the Nokia OVI Store and on the Google Android Market. If you would like to add a search engine, you will need to write a regular expression, and fill several fields in the settings. To help you with that, you can use the RegExp Validator application which uses the same algorithm as SynoLoad for regular expressions. Just replace XXXX by a simple title (which will be seen in the app) and YYYY by your newznab server URL. For example, just enter "http://dev.patey.net/sabmobile/nn?TITLE=NZBs.in&URL=https://www.nzbs.in/api" in the "Add from URL" field in SABMobile. If you can't manage to add your own, don't hesitate to contact me for help!